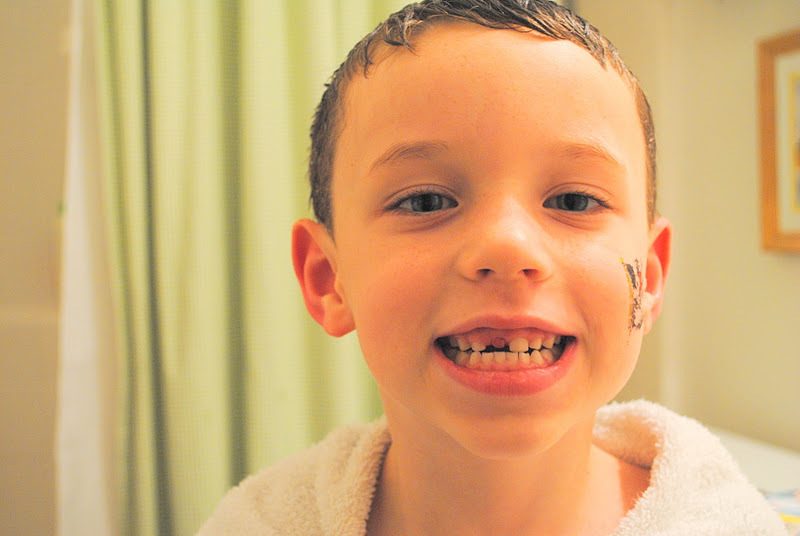 After exactly seven years and five weeks of life on Earth Luke finally lost his first tooth! Needless to say, it was a big deal. 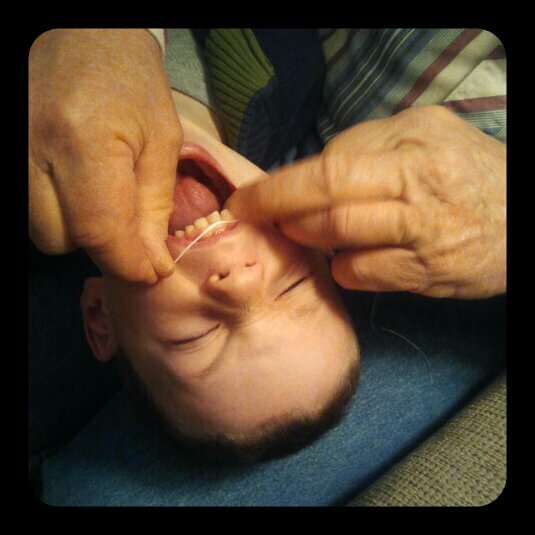 Luke had been trying to get that tooth out for a while. My Dad even tried to help one day a few weeks back. No, I did not cry when the tooth finally came out, even though I will never see the same smile again -- the one with all those perfect little white teeth. Now I see a perfect smile with a gap in it. Still cute….just in a different way. 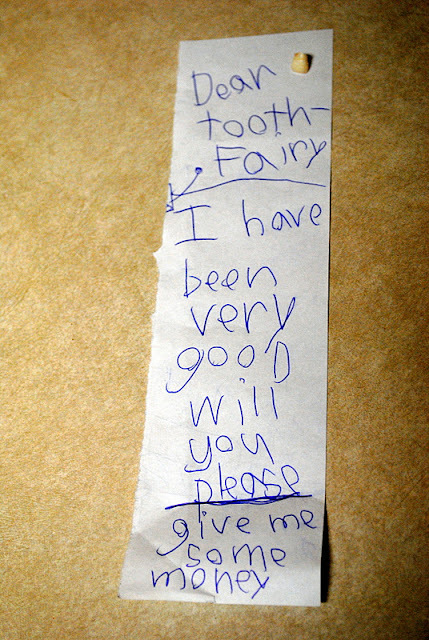 I personally never wrote a letter to the tooth fairy, but Luke felt a letter was in order. I guess he wanted to be sure she knew he had been good. After the Saturday night we had just had, I can understand how he wanted to set the record straight. :-) It’s all good. At around 2 in the AM I was awoken by a VERRRRY excited Luke who was talking, but in my fog of being woke up I could not really determine what he was saying. 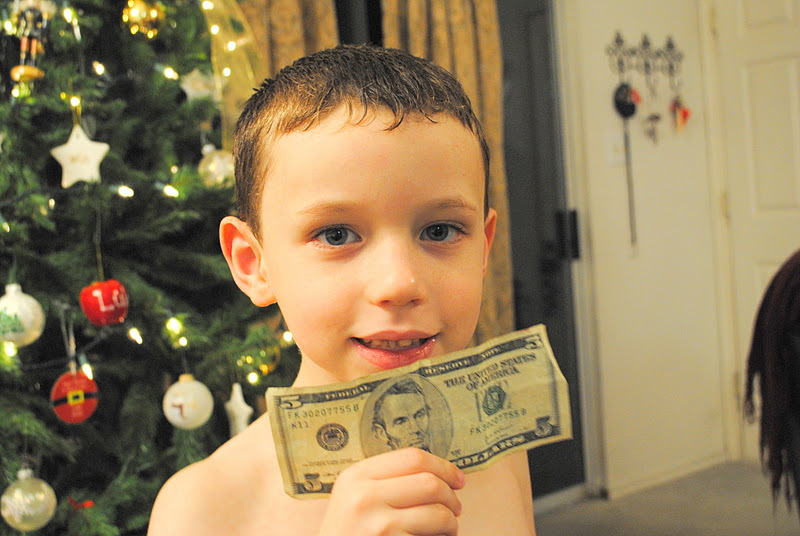 I could tell by the money he was shoving in my face that the tooth fairy had come. I think I said something to him. I know I gave him a hug. Then I went back to sleep. The following morning I asked what the tooth fairy had left and Luke seemed confused that I could not recall the conversation we had about four hours previously. He then explained (apparently for the second time) that he had received a whopping five dollars!